Fleet Week SF is upon us, which mean fighter jets streaking across the skies at 700mph, smartly dressed sailors strutting their stuff around town, and all the Top Gun references you can handle in seven days. Whether you fantasize about high-speed drug busts with the US Coast Guard or plan to catch the eye of a seafarer in uniform, we’ll tell you the best places to be and things to do this Fleet Week. The US Navy’s Blue Angels put on a high-speed acrobatic flight show every year, and it’s a must-see. 21-million dollar fighter jets acing maneuvers, zipping just 18 inches from one another? Oh yes. Unless you live in a penthouse in the Marina, the best place to catch the show is from Fort Mason, or head to Marina Green and settle in with blankets and a picnic. Tickets for waterfront box seats are also available, if you’re feeling flush. The Blue Angels are on from 3pm, but catch the earlier parts of the Air Show too—highlights include the Leap Frogs parachute team. Oct 10-12, 12-4:30pm. If watching the Parade of Ships from a distance isn’t enough, get yourself on board a genuine, in-service US Navy ship. Explore the Coast Guard’s USCGC Boutwell, a cutter that recently hauled in 28,000 pounds of cocaine—worth over $423 million—from a counter-drug mission off the coast of San Diego. An achievement not to be sniffed at. The tours are free, so make sure you’re there early to beat the lines. Piers 15-17, 30-32, 80; Oct 8, 10am-2pm; Oct 10-12, 9am-4pm; free. The perfect excuse to start a conversation and flash a winning smile. Sailors, marines and coasties will be out in force this week, so find some good ones and fill your friends’ Facebook feeds. This wouldn’t be San Francisco if we didn’t mark the occasion with food trucks. Off The Grid does the honors here with Fleet Fest in the Dogpatch, featuring food, live music and a beer garden. The festival is also a celebration of the 2,000 servicemen and women in town for the week. Try dropping some salutes, and if things go well, maybe you’ll be getting a few in return by the end of the night. Pier 80, Oct 11-12, 10am-6pm, free. Don’t want to jostle with the crowds on shore? Book yourself and some friends onto a cruise and watch the action from the Bay instead. Hop onto a 55-foot catamaran with Adventure Cat, and enjoy the view while you’re being plied with drinks and appetizers. Blue & Gold is taking to the water too, with a buffet lunch and open bar. For a more traditional option,you can’t beat The San Francisco Belle for some 19th century riverboat glamor. 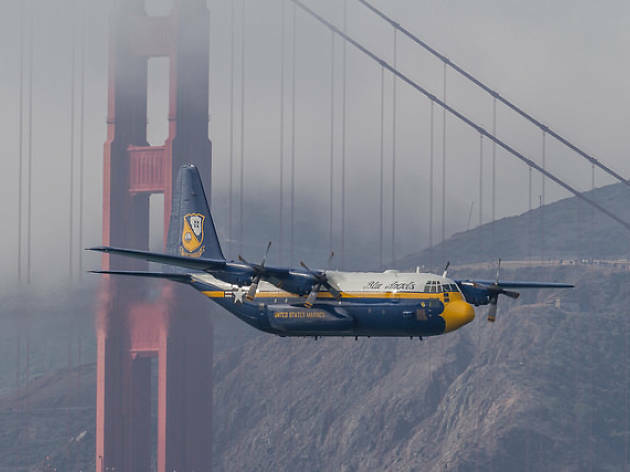 Those Blue Angel fighter pilots, earlier seen zipping around the skies at 700mph, will also be doing a meet-and-greet in Fisherman’s Wharf. Some of these pilots trained in the Navy’s elite training school, TOPGUN (yes, we’ve discovered it’s actually a thing). So if you’re trying to net yourself a Tom Cruise lookalike (or a lady version) for the nights ahead, this is literally the best chance you’re going to get all year. Entrance Plaza, Pier 39, Oct 10th, 6:10pm. It’s not just service men and women who’ll be in town this week—Fido and Fluffy are in on the action too. Head to Duboce park to watch military canines demonstrate search and rescue operations; some of these pooches are actual Iraq and Afghanistan war veterans, trained to locate explosive devices. Duboce Park, Oct 10, 10am-1pm; free. What’s more alluring than a sailor in uniform? A sailor in uniform who also plays guitar. Catch the Navy Band Southwest belting out jazz standards and rock ‘n’ roll hits in Fisherman’s Wharf all week long. If you fancy a bit more oom-pah, join the 1st Marine Division Band on Friday as they march through North Beach or stop in at the Powell Street Cable Car turnaround. 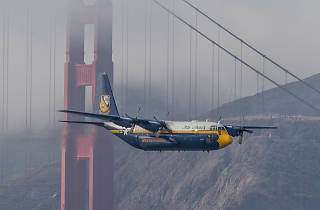 San Francisco Fleet Week is a non-profit, and they’re crowdfunding for this and future events. Check out www.gofundme.com/BuyABurger and support a sailor, coastie or marine. Though if you’d rather do it in person, your best bet might be Off the Grid’s Fleet Fest at Pier 80. Inexplicably, there’s also a Country Music Festival in town to coincide with Fleet Week. If you want a break from all the military muscle, head to Fort Mason Center. With craft beers, whiskey flights, BBQ and cover bands, you’ll be getting into the line dancing in no time. Country Bandwaggin, Oct 10, 2-10pm, tickets from $20.